You may be familiar with the term “gingivitis,” but may not realize until it’s too late that you have very little to no in-depth knowledge of it. Gingivitis is the swelling and inflammation of the gum tissue (also known as the gingiva) around our teeth. Gingivitis often precedes periodontal (gum) disease, and is actually considered to be the mildest form of periodontal disease. Gingivitis can be prevented, treated and even reversed if caught in time. If we do not catch the gingivitis early enough, gingivitis can lead to complications such as infection of the teeth, gum and jaw bones. This infection can ultimately lead to tooth loss, gum disease, and much bigger problems. Not treating your gingivitis can result in periodontitis, which is an advanced form of gum disease. If you do go on to develop this advanced form of gum disease, it is likely you will wish you had taken the proper precautions to prevent, treat and/or reverse gingivitis from the beginning of time as it can cause great risks and complications for your overall health. Symptoms you can look out for yourself include redness where the tooth and gums meet, swollen gums, bleeding when brushing and flossing and bad breath. There is usually no pain associated with gingivitis. Many people are not aware they even have the condition. There are numerous causes of gingivitis and you should evaluate what your personal cause may be. Lifestyle choices, dental hygiene, smoking, diabetes, genetic predisposition, puberty, hormonal fluctuations, aging, systemic diseases/conditions, stress, inadequate nutrition, pregnancy, substance abuse, HIV infection, certain medication use, and more are all contributing factors. Risk factors vary and depend on each individual. Make sure to regularly keep an eye on the conditions of your teeth and gums. Always make sure to thoroughly brush twice a day and floss once a day. Keep in mind that most cavities and periodontal disease start between your teeth and gums, where you cannot reach with your toothbrush or see upon self-examination. Flossing is essential to access these areas because the bristles on your toothbrush are not able to reach into those spaces and properly remove plaque, tartar or bacteria. Do not rush through your dental care routine. You can simply brush your teeth twice a day for two minutes each time and floss at least once a day for great long-term benefits. This only takes a few minutes of your day and is more than worth the time investment. It is very important that you seek routine cleanings to remove plaque that can accumulate in your mouth. If you do not remove plaque every 24 hours, the plaque turns into tartar. Tartar is a hard calcified deposit that invades your teeth and gums by going below the gum line and wreaks havoc on your teeth and gums. This is why routine cleanings by your dentist are so important. It is important to educate yourself on what gingivitis is since it can come about in a silent, painless, and symptomless manner. If you do not have gingivitis, prevention is something you should make a top priority in your life. Your dentist can perform a thorough examination. During this exam any changes in gum shape, color or contour will be checked and there will be an assessment of any bleeding in the gums upon probing. If you have gingivitis, treatment will always include professional cleaning, which removes plaque buildup from the teeth. Your dentist will then help set up a home care plan for you. This plan will treat your gingivitis and you can start the reversal process immediately. Do not postpone anything to do with your health. 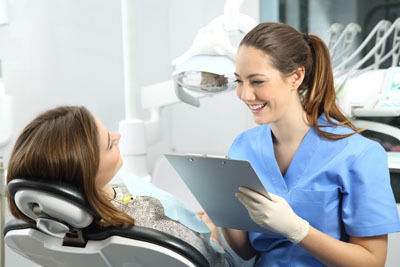 Set up a routine appointment with your dentist today and make sure to follow a regular home care routine as well.